The first edition of Embryos, Genes and Birth Defects, edited by the late Peter Thorogood, was a radical new book aimed at bridging the gap between the medical disciplines of embryology and dysmorphology, and recent advances in cellular, molecular and developmental biology. This new edition remains unique in its breadth and brings up to date our understanding of birth defects and of the strategies utilized to gain such knowledge. It features new chapters on human cytogenetics, mutagenesis and the eyes and ears. 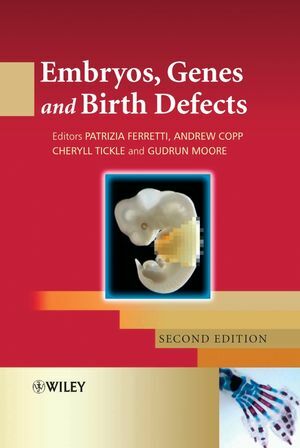 The book presents key topics in developmental biology and explains how they provide the foundations for understanding clinical birth defects. The first six chapters introduce concepts and strategies adopted to elucidate developmental anomalies leading to birth defects. The book then focuses on specific organs and reviews the cellular and molecular mechanisms affecting their development and how disruption of these mechanisms by genetic or environmental factors may underlie certain birth defects. The chapters are concise and provide up-to-date coverage of topics in a format that is easily accessible and yet at the forefront of research. Written primarily for paediatricians, obstetricians, clinical geneticists and allied workers, this book guides the reader through the contribution of modern molecular biology to our understanding of human development. Developmental and cellular biologists will learn how errors in the cellular and genetic mechanism can lead to classical disorders, diseases and syndromes. Dr. Patrizia Ferretti. Developmental Biology Unit, Institute of Child Health, University College London. Prof. Andrew Copp (Dean of Institute). Neural Development Unit, Institute of Child Health, University College London. Prof. Cheryll Tickle. Professor of Anatomy & Physiology, The Wellcome Trust Building, University of Dundee. Prof. Gudrun Moore. Institute of Child Health, University College London. The editors are all distinguished developmental biologists with a broad range of expertise in human birth defects. Andrew Copp holds an endowed chair in Developmental Neurobiology at University College London and is Dean of the world-renowned Institute of Child Health. 1.1. 1. The Relationship between Genotype and Phenotype: Some Basic Concepts (Philip Stanier and Gudrun Moore). The relationship between genotype and phenotype. The role of ‘model systems’. The changing concept of homology. 2. Uses of Databases in Dysmorphology (Michael Baraitser). Some of these problems are addressed by dysmorphology databases. Where databases do not help. 3. Human Cytogenetics (J. D. A. Delhanty). The genesis of chromosome abnormalities. The cause of high levels of chromosome abnormality in human embryos. Relative parental risks – age, translocations, inversions, gonadal and germinal mosaics. 4. Identification and Analysis of Genes Involved in Congenital Malformation Syndromes (Peter J. Scambler). Biological analysis of genes implicated in birth defect syndromes. Why study rare human birth defect syndromes?. 5. Transgenic Technology and Its Role in Understanding Normal and Abnormal Mammalian Development (Valerie Vidal and Andreas Schedl). Genetic manipulation using gene targeting in ES cells. 6. Chemical Teratogens: Hazards, Tools and Clues (Nigel A. Brown) (with revisions by Cheryll Tickle). General strategy in chemical teratogenesis. 7. The Limbs (Patrizia Ferretti and Cheryll Tickle). Developmental anatomy of the human limb. Main classes of limb defects. Contemporary studies on mechanisms of limb development. How, when and where experimental studies elucidate abnormal development. 8. Brain and Spinal Cord Andrew J. Copp. Overview of nervous system development. Defects of CNS development: towards a genetic and developmental understanding. 9. Birth Defects Affecting the Eye (Jane C. Sowden). Congenital eye defects and paediatric blindness. Gene mutations underlying congenital eye defects. Cellular and molecular mechanisms affecting eye development and how they elucidate the causes of abnormal development. 10. The Ear (Sarah Spiden and Karen P. Steel). Development of the outer and middle ear. Development of the inner ear. Main classes of ear defects. Mechanisms involved in development of the outer and middle ear. Mechanisms underlying inner ear development. Mechanisms underlying development of inner ear sensory epithelia. Mechanisms involved in endolymph homeostasis. 11. Development of the Enteric Nervous System in Relation to Hirschsprung’s Disease (Heather M. Young, Donald F. Newgreen and Alan J. Burns). Anatomy and function of the ENS. The best-characterized developmental defect of the ENS – Hirschsprung’s disease. Cell biology of ENS development. Molecular biology of ENS development and Hirschsprung-like dysplasias. HSCR: current and future treatments. 12. The Head (Gillian M. Morriss-Kay). Main classes of craniofacial defect. 13. The Heart (Deborah Henderson, Mary R. Hutson and Margaret L. Kirby). Major cell populations needed for heart development. Molecular regulation of heart development. 14. The Skin (Ahmad Waseem and Irene M. Leigh). Main classes of skin defects. 15. The Vertebral Column (David Rice and Susanne Dietrich). Developmental anatomy of the vertebral column. 16. The Kidney (Paul J. D. Winyard). Growth factors and their receptors. Non-genetic causes of renal malformations. 17. The Teeth (Irma Thesleff). Cellular and molecular mechanisms affecting development. How cellular and molecular developmental mechanisms assist in elucidating the causes of abnormal development.